Google today announced the addition of templates to its Google Sites, an application used to create hosted Web sites and part of the Google Apps suite. Google Sites now offers a variety of template styles for business and personal sites. Available to both free and paid users, the templates include entire collaborative workspaces, employee intranets, project tracking sites, team sites, and employee profile pages. Several dozen templates are available, with more being added. Personal templates are also available, including family sites, weddings, neighborhood associations, clubs, charitable causes, and other interests, said Scott Johnston, Google Sites product manager. Each template is comprised of between 15 and 20 pre-populated pages, including sample content, embedded gadget, page layouts, navigation links, and themes. The templates can be modified, up to a point, using Google Sites' built-in editing tools. Companies using the paid Google Apps Premium Edition are able to create template sets for use by their employees, Johnston said. In that way, standard templates can be used across individual departments or entire companies, as the customer desires. 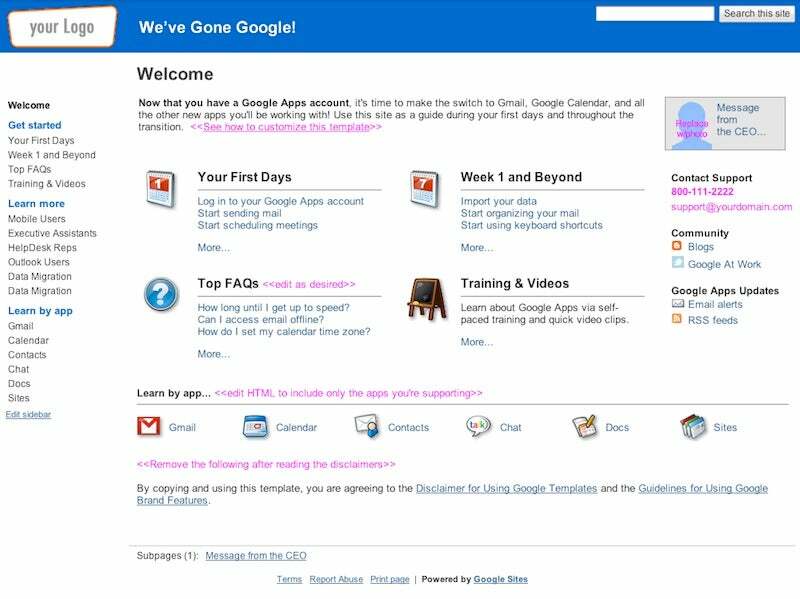 Businesses using Google Apps with Sites can use an intranet page like this one to help teams make the transition. The goal of the new site templates are to help Google Apps users get collaborative sites up-and-running quickly, especially for projects and intranets that are a good match for a templated approach. In posts to the Google Official Blog and its Enterprise Blog, the company makes no claims about how Google Sites might compete with other vendors, but quotes customers who do so. "Luke Leonhard, Web Services Manager for Brady Corporation adds, 'With our old IBM Lotus Quickr solution, it took seven clicks and three page refreshes for employees to publish new information internally. Google Sites makes it just two clicks.'" Google Sites templates will appeal to companies and users who want to get up-and-running quickly and cheaply, and who value ease-of-use more than an overload of enterprise features that often get in the way. Microsoft will doubtless be quick to point out that Google Sites and Microsoft SharePoint meet many of the same, but also widely divergent, customer requirements. SharePoint is a Microsoft collaboration technology that has been criticized as too cumbersome for the needs of many potential customers. Google and Microsoft both offer cloud-based applications, seen as a key battleground between the two. Microsoft recently lowered the prices of its online applications to better match Google's pricing for its paid Google Applications Premier Editor. The new Google Sites templates became available at 12:01 AM Eastern Time today.